A new Machining G Unit and Stride Bonus Grade 3 appear together. ACT (VC) 1/Turn:[Counter Blast (1) & Choose a face down card from your G Zone, and turn it face up] If you have a heart card with “Machining” in its card name, choose the same number of your units as the number of face up cards in your G zone with “Machining” in their card names, and [Stand] them. Your opponent chooses two of his or her [Rest] units for each unit [Stand], and they cannot [Stand] during your opponent’s next stand phase. AUTO (VC): [Counter Blast 1] When you Stride with your G Unit whose original name includes “Machining”, you can pay the cost. If you do, choose up to 2 Grade 1 or higher “Machining” cards in your Soul, Call them to separate (RC) at Rest. AUTO (VC) Generation Break 2: When your turn ends, choose up to 2 cards in total from your (RC) and/or hand, place them into the Soul. If you place 1 or more, draw 1 card, and if you place 2, Counter Charge 1. For Today’s Card, we’re introducing the following from the Extra Booster “The AWAKENING ZOO” (on sale Friday December 8th, 2017): The 《Megacolony》 【Machining】 G Unit “Oppression Mutant Deity, Machining Despot” and the Grade 3 “Machining Beet Atlas”. 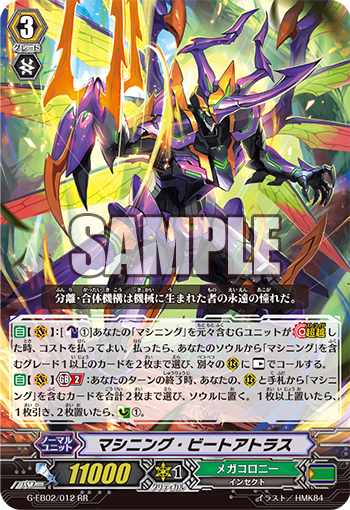 “Oppression Mutant Deity, Machining Despot” Stands a number of ally Rear-guards equal to the number of face-up Machining in the G Zone, and for each Unit that Stands, your opponent chooses 2 of their Units, and those Units cannot Stand during the next turn. Since this Skill targets “Units”, if your opponent has 1 or less Rear-guards, you can forcefully seal your opponent’s Vanguard from Standing! You’ll want to combine this ability with the Stride Skill of the Grade 3 “Machining Beet Atlas” below and “Machinning Stag Beetle”. That “Machining Beet Altas” lets you pay 1 Counter Blast when you Stride to choose 2 Grade 1 or higher “Machining” from your Soul to Call at Rest. If you use it in conjunction with the aforementioned “Despot”, you’ll be able to Stand the Units Called at Rest. Also, when the turn ends, you can place 2 “Machining” from your Rear-guards or hand into the Soul, and if you place 1, you can draw 1 card, and if you place 2 you can Counter Charge 1. Since its Stride Skill costs a Counter Blast, by using its Skill to place Called Units back into the Soul, you can aim to consistently use its Stride Skill every turn! These two greatly power-up “Machining” Decks! We’ll be introducing more cards from the Extra Booster “The AWAKENING ZOO” in the future! Please look forward to it!